You can think of SmartDocs as customizable Data Containers. Your very own "Data wrappers". Whether they include an actual file or not, SmartDocs are a great way to create, store and share valuable and organized information. 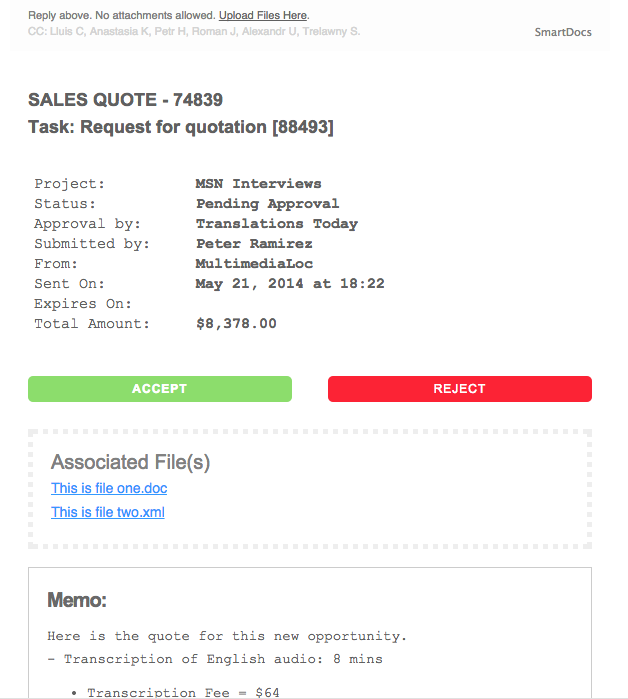 You can send your vendor a Purchase Order SmartDoc with a PDF you already send on email or with only the basic data you need to convey the same message. When they receive it, it will include all the financial information and notes you need for them to verify and, even, Accept or Reject it if that's how you work with them. Both you and your partners will then be able to analyze them and download their data through customizable Reports. Whether you need to send a PDF with your invoce or don't have an actual file you use to send your Quotes to your clients, bCommunities provides a way for you to send and receive any specialized document your company needs. 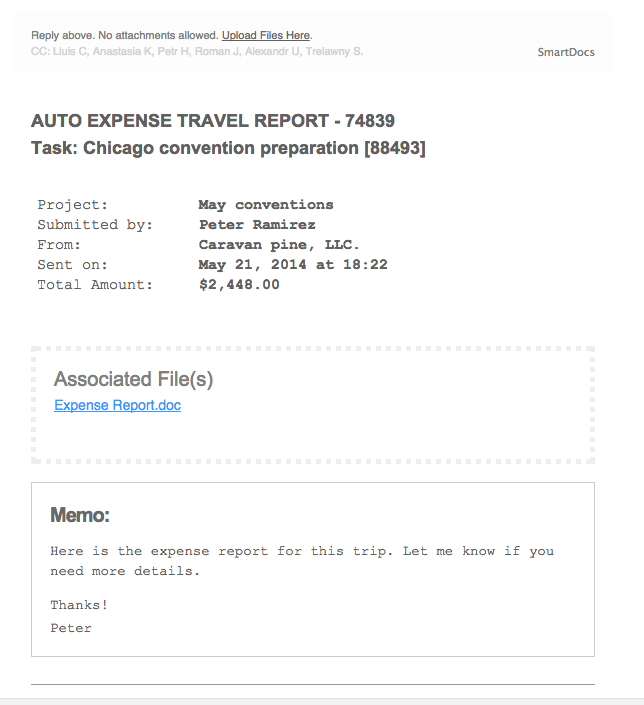 Your Administrators and Project Managers can create a SmartDoc template on the fly while assigning a task or in the Settings tab. Just add the metadata you need. See below for a list of options. From that moment on, all your employees, Project Managers and above, will be able to add them to your tasks as Source, Reference or Deliverables. Create SmartDocs that fit your business needs. Do you need your employees to always include a Document ID? Select that option and make it Mandatory. 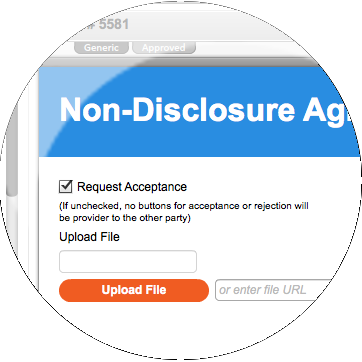 An Non-Disclosure-Agreement will probably not include any financial information but you probably want to request approval from other parties in the task. 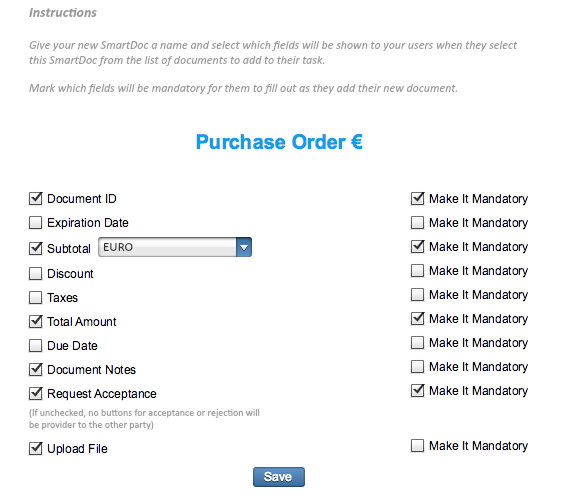 Does your SmartDoc require a file to be added to it always? 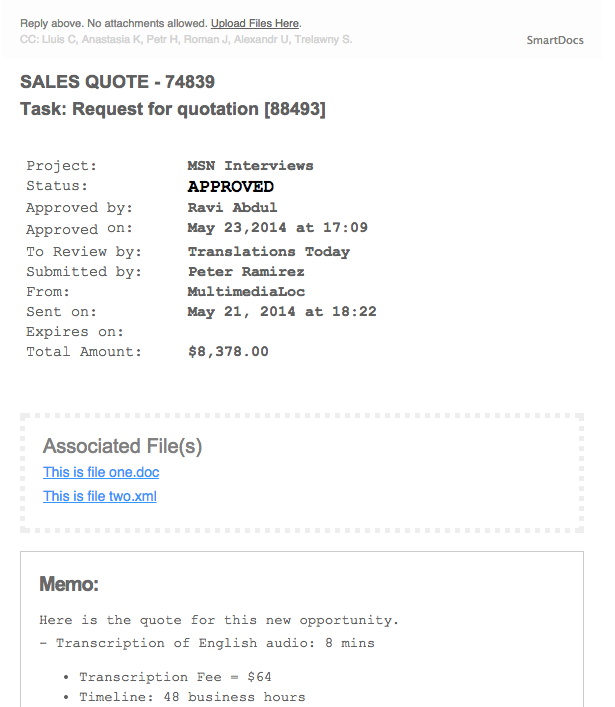 You can even make a particular Purchase Order document for Euros and another one for US$. Let us know what else you'd like to see appearing as options. We welcome your feedback. 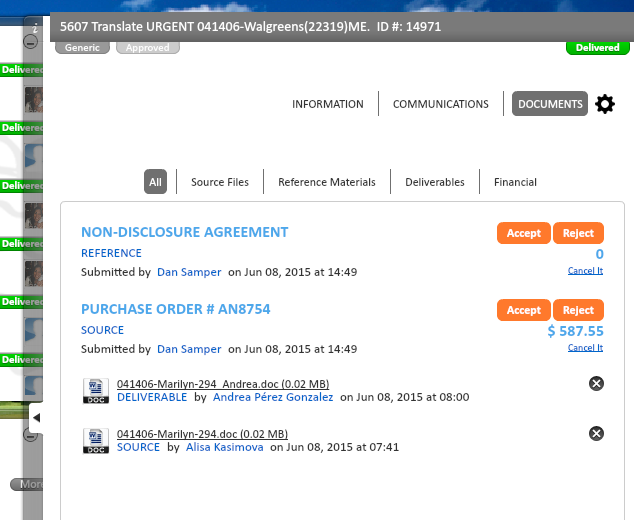 Your project managers and administrators will now be able to include your own SmartDocs to any task. 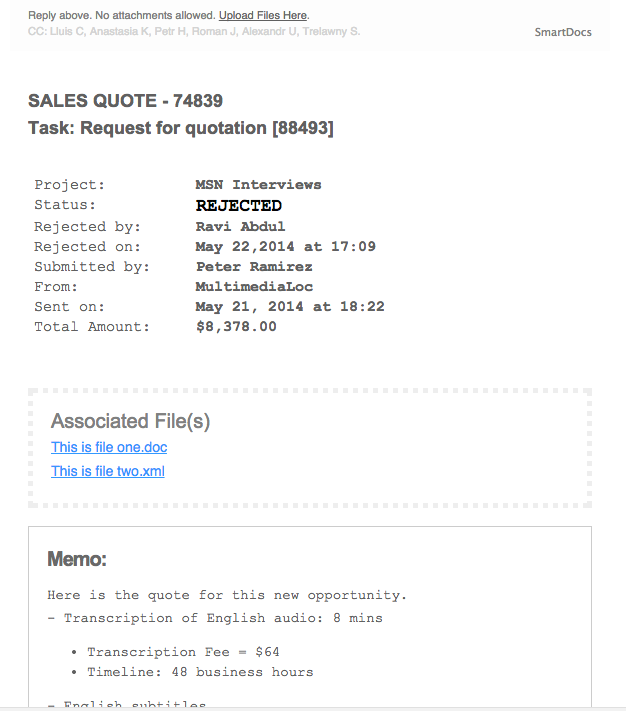 Submit PO's, RFP, Invoices or Meeting Minutes for analysis and approval of your business partners. Classify them as Source, Reference or Deliverable files. Keep clear records of who approved or rejected them. When you generate a SmartDoc, an email notification gets sent to the intended partners containing all the data they need to act on it. They can print that email for filing purposes or to keep a legal audit trail of their engagement with your company.